The U.S. dollar is standing at the edge of a cliff, and most people don’t even know it. Data released by the New York Federal Reserve shows that foreign central banks have been net sellers of U.S. treasuries over the past five weeks, with $48 billion having been sold since late July, and $32 billion in just the last two weeks. The U.S. runs budget deficits each year. If foreigners stop buying treasuries—or worse, start selling them—the dollar could be in big trouble. The reduction in treasuries “comes as a big surprise and it is definitely worrying,” said Hans Redeker, foreign exchange strategy chief at bnp Paribas, one of Europe’s biggest banks. The nation that analysts are watching especially closely at this stage is China. Whether or not Beijing is selling its dollars can’t be officially confirmed until November, when the Treasury releases its tic data. 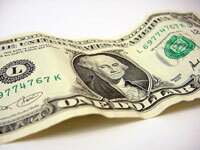 However, top Beijing officials have been signaling for at least two years that dollar sales are increasingly imminent. This past August, two Chinese government officials highlighted China’s massive U.S. dollar holdings (which include treasuries) and how it supports the value of the U.S. currency. They also noted that Beijing could use those holdings as a political weapon to counter congressional calls to revalue the yuan and impose trade sanctions on Chinese goods. Chinese state media referred to the country’s stockpile of U.S. dollars as its economic “nuclear option,” capable of destroying the dollar at will. Beijing also clearly signaled that it would begin “diversifying” out of the dollar earlier this year when it announced plans to rebalance its $1.34 trillion currency reserves, which are mostly U.S. bonds. Already Beijing has created a $300 billion investment fund to use those dollars to purchase other assets in an attempt to increase its investment returns. It should come as no shock, then, that China would now be selling its dollar holdings. The danger, as the Telegraph notes, relates to the fact that China holds such a large amount of treasuries. Any confirmed evidence that China was no longer supporting the dollar, and was actually selling it, risks setting off “an unstoppable stampede” in which other nations would seek to dump their holdings before China swamps the market and demand for dollars is overwhelmed. The implications of a run on the dollar due to Chinese treasury-dumping go far beyond just the value of the greenback. Chinese demand for treasuries is one of the primary pillars supporting the dollar’s value. When China buys treasuries, it keeps the dollar strong, interest rates low, Chinese imports inexpensive, and consumers spending. Remove that pillar, and the whole U.S. economy is thrown into jeopardy. The Trumpet has warned not only against the danger of relying on foreign creditors, but also that deteriorating economic conditions in general are frighteningly imminent. Even if China has not decided to dump the dollar yet, America’s massive and growing debt loads, huge trade deficit, ballooning government entitlement spending and corruption-plagued financial system based upon a precarious fiat currency mean that the dollar is certain to drop further in value. The United States received the first crucial evidence that the tumbling housing market and a vicious credit crunch may be pushing it toward recession after figures showed it shed 4,000 jobs in August -- its first outright decline in four years. The stunning number -- economists were forecasting a 100,000 gain -- coupled with downward revisions to previous months, sent stock markets reeling and the U.S. greenback to a 15-year low against major currencies, and raised speculation the U.S. Federal Reserve may chop interest rates 50 basis points instead of 25 at its Sept. 18 meeting. And while Canada released solid jobs numbers yesterday, holding out hope the economy will resist a U.S. slowdown, analysts saw some chinks in the report. At least one economist is calling for a rate cut north of the border as the global credit crunch weighs on growth. "The [U.S.] jobs data ... is simply horrific and fans the most pessimistic fears -- the housing market woes will undermine the U.S. consumer, push the U.S. economy into recession and drag down growth in much of the rest of the world," said Marc Chandler, foreign-exchange strategist at Brown Brothers Harriman in New York. "A 25-basis-point cut now would be disappointing. The Fed needs to get ahead of the proverbial curve." The Dow Jones industrial average slid 1.87% to 13,113.38 on the report, the Nasdaq dropped 1.86% to 2,565.70, while Toronto stocks fell 144.48 points, or 1.1%, to 13,651.21. The U.S. dollar index, which measures the greenback against a basket of currencies, fell to its lowest level in 15 years while investors fled to the safe haven of gold and U.S. treasuries. U.S. interest-rate futures priced in a 76% chance the Fed would drop interest rates to 4.75% from its current 5.25% setting, compared with 42% odds yesterday. While the United States managed to hold its unemployment rate steady at 4.6%, details of the payroll report were poor with manufacturers, builders and even the government shedding jobs. What's more, the trend is clearly weakening. Employers added only 44,000 to their payrolls on average over the past three months, compared with 147,000 in the first five months of the year and 189,000 in 2006, the Financial Post reports.